Through some research, I discovered that the dining room in our house wasn’t always the dining room. It was, in fact, the Victorian parlor. At some point in its 122 years, one of the four families who lived in this home made it the dining room. In the process, they tore down the chimney and removed the fireplace and mantle piece, remnants of the hearth can still be seen in the basement. This is a great example of thinking different – in other words, by using space in ways that differ from their original intent. 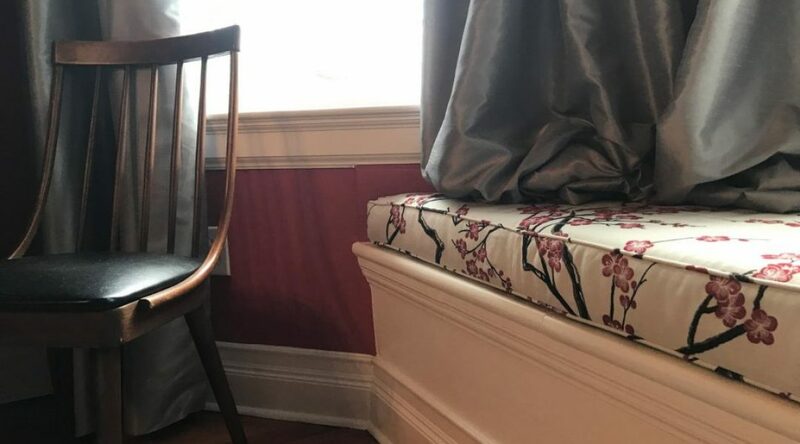 Along the way, someone added a colonial-style chair rail, more commonly found in the Home Depot than in late 19th century homes. And the same folks probably ripped out the Victorian baseboard that once circled around the room in favor of a commonplace colonial style. Remnants of this can see if you lift the window seat. They may even be the same people who painted all the white oak woodwork and doors white. Some people have no respect for the architectural integrity of an antique home. Sigh. So, first thing’s first – we ripped out the idiotic chair-rail. Next, we shored up the remaining original millwork by sanding down globs of paint to make it look smooth and elegant. 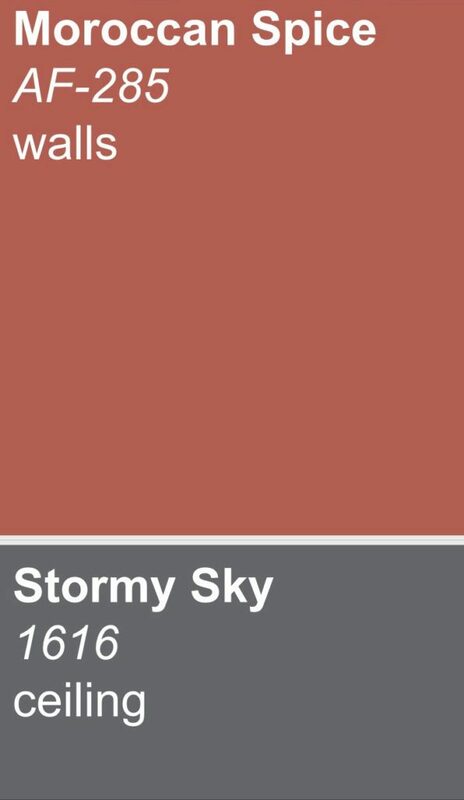 And we chose a very traditional wall color, “Moroccan Spice” by Benjamin Moore. It played into the accent color for the parlor. We paired it with their “Stormy Sky” for the ceiling and a crisp high-gloss white for the millwork. 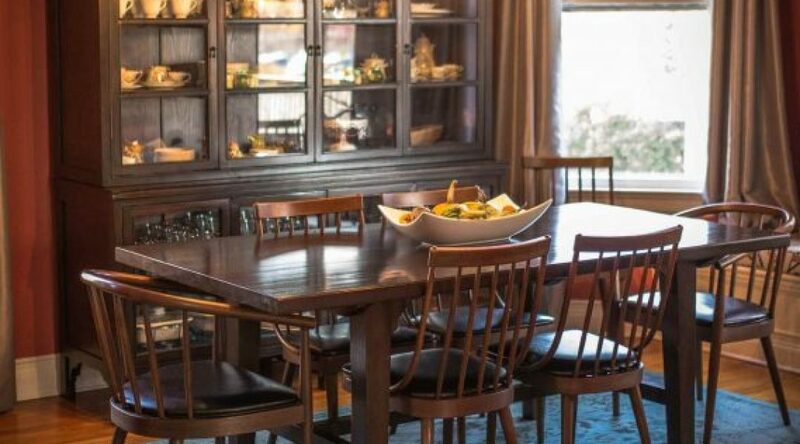 Unlike the parlor, we had all the furniture needed to outfit this room: a table and china cabinet from Room & Board, eight Thonet-style chairs (bentwood movement) that I purchased off of Ebay, a Stickley mirror, and a beautiful late 19th century Chinese desk that we use as a buffet table. Personally, I think this is too big for the room – I need something smaller. 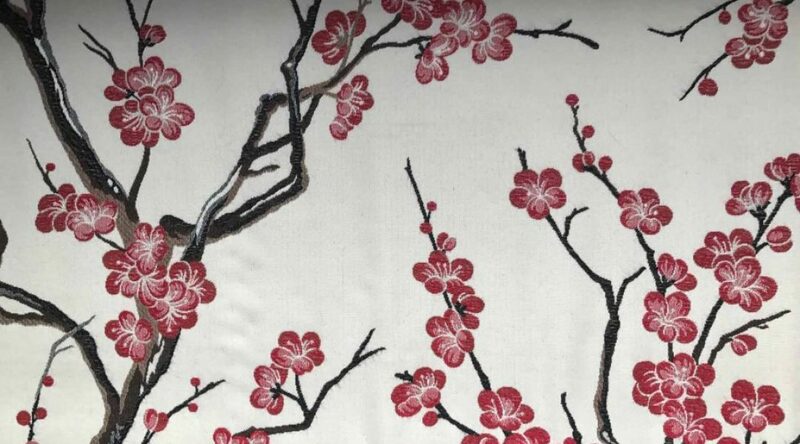 We updated the window-seat cushion with a modern, Asian-inspired fabric that pulled in the browns, greys, and reds. But it was still wanting…maybe it was the absence of a chandelier. The previous owners excluded it from the sale of the home. It wasn’t our style, so no biggie. Besides, this room needed a statement piece. At first I went on the hunt for period chandeliers – preferably one from the period that had been wired for modern usage. And I found some, but to be honest, I didn’t like them. I needed something louder… bolder. That said, the prefect chandelier would incorporate Victorian elements. But what were they? The period chandeliers that I opted against, had lovely round glass bulbs. Industrial steampunk design would give that look some edge. 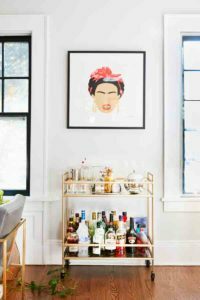 Restoration Hardware’s marriage of these two elements in their Bistro Globe Clear Glass in brass provided me with the perfect chandelier and the perfect finishing touch for the room. Architectural Design | Who Designed No. 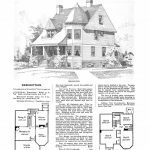 139 Maplewood Avenue?